A bit ago a friend of mine asked me to speak at a smaller private meeting at his home, attended entirely by their leaders from a well-known MLM company. Also though, the current state of (social) network marketing, and how leaders can really skill up, even if they thought they were “already online” and had built their teams using the social media platforms. Truth is, even the social media strategies that worked just a few years (or even months) ago are not as effective, for reasons I’ll reveal below. Now if you feel like you may be missing something in terms of utilizing today’s technology and social channels to the fullest, then this is for you! Their team had already created immense success with the regular (now ‘old school’) prospecting, and most in the past 3 years, using social media recruiting tactics now being marketed by all the “gurus”. But now they’re experiencing slower growth, as these methods aren’t working as well as they once were. Social media recruiting in general is not working as well because now sooo many networkers have jumped on the social band wagon and the savvy public is catching on. So they asked me to reveal some ‘next level’ strategies with them, since they knew that I had been working on social network (actual) marketing since 2010. Their minds were completely blown wide open and it made them open up to all the new possibilities. And for the first time in a while, they were (re)excited about the future of the social selling & network marketing! Truth is, many leaders in network marketing are uncomfortable (and even threatened) to admit that they may not know everything about their profession…especially if they are a top earner. But if you notice, the best entrepreneurs in the world, in any field, are those who are always outside of their comfort zones, looking for new cutting edge ideas. They study. They find out what competitors are doing. They invest in research and development. They innovate and take advantage of new technologies. So what these leaders did was not only outside the norm of network marketing, but can even be frowned upon by other leaders and colleagues. And (even though it’s happening at turtle’s speed), it seems many things are changing… fewf, lol! Leaders in network marketing are extremely sloooow to adopt new formulas, systems and tactics. Even today, many of us leaders still don’t realize that it’s more comfortable sticking with what you know and throwing stones at things that are done differently. I’ve personally had stones thrown in my direction since 2011, because I’ve been one of the pioneers willing to call out the old-school building leaders and ask them to step out of the ‘norm’ enough to see what was going to happen. This doesn’t even have to be online, but simply any time you’re attracting instead of “chasing” your prospects down. So if you work to solve people’s problems and you become branded – (known for helping people solve certain types of challenges), then others will literally seek YOU! You will build massive credibility by helping people get what they’re looking for – helping them get the results they want. At level zero, you’re not utilizing modern technology in any meaningful way — except maybe your cell phone to send awkward prospecting messages to your friends and family, knowing you have an agenda, lol! At this level of sophistication (or lack thereof), you’re not yet utilizing what’s currently available online. If this is you in any way, my suggestion is to not stay here long! Here, instead of prospecting your friends and family or people from your phone, (or even strangers in public), now you’re doing warm and cold market prospecting on Facebook, Linkedin, or somewhere on social media. The bigger the following and depending on the trust, you can expect your posts to start causing more and more people to reach out to you, requesting more info about your product (and sometimes business). My friend Gloria refers to this process as being “fake social”, which I guess is true, depending on whether or not you care about the people you’re connecting with. Level two is a big part of what I focus on using the Elite Marketing Pro platform and this is what real attraction marketing truly is. Attraction marketing is highly leveraged, and that’s essentially what we focus on with our Elite Marketing Pro platform. Everything at this level is scalable because we can, for example, take a post that’s working on a personal profile, put it on a business page, target the followers of Robert Kiyosaki, hit a button, and all of a sudden it’s put in front of millions of people who are open to entrepreneurship! Personally, I recommend bypassing Level 0 and Level 1 and starting here. You can download our (free) Attraction Marketing Bootcamp here to get started. NEXT is something you probably won’t take on until you’re at least a six-figure earner in your network marketing business, but I do want to share a bit on this with you. I consider these seven-figure skills, because even though you start them at six-figures, the goal of this level is to push your business to seven and eight-figures. This is attraction marketing on steroids. It’s most definitely scaled up. And if you’re not there yet, that’s ok. Level 2 is what I would suggest. Bottomline is that in real businesses people innovate and think outside the box in order to make innovative things happen. I highly recommend you sign up for our FREE Attraction Marketing Bootcamp. Once you opt-in, you’ll get an overview of how attraction marketing actually works and learn about a paradigm-shifting e-book called “The Attraction Marketing Formula”. That being said, there is still A LOT we do here, which they are NOT open to sharing with you yet, and there lies the opportunity for you. You don’t have to do any innovation of your own, to have that UNFAIR Advantage ’cause others have already done it. If you’re ready to get ahead of the curve and become a leader who’s willing to modernize their business, then simply click here and I’ll gladly give you access to our Online Recruiting Bootcamp. 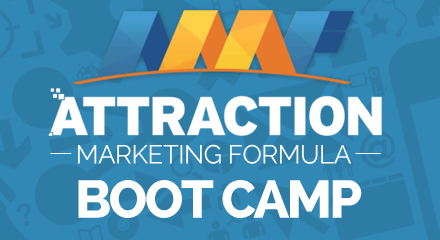 I also recommend you pick up a copy of that e-book, the Attraction Marketing Formula & included bonuses, which you will learn about after you request the Bootcamp. Previous Post Scared Money Don’t Make Money – (5 Do’s and Donts of Wealthy Friends) Next Post The 3 Biggest Misconceptions In (Social) Network Marketing…SOLVED.